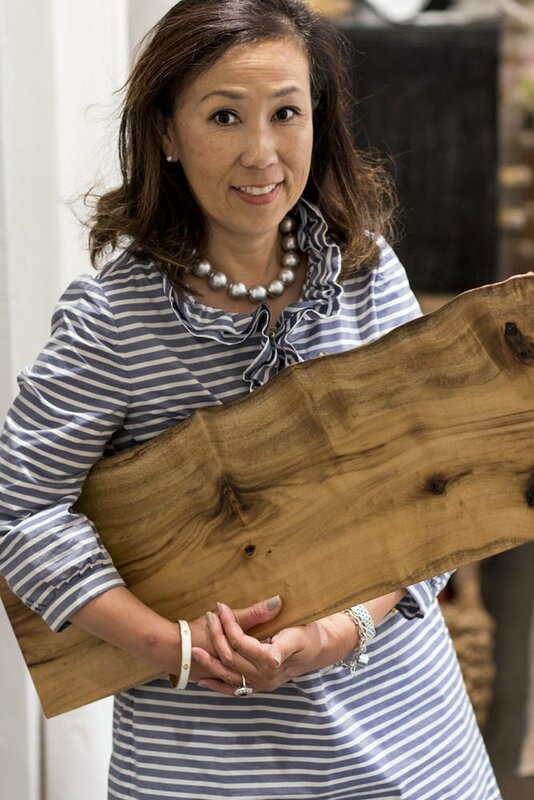 Designer Miyuki Yamaguchi carries a shelf for a project. 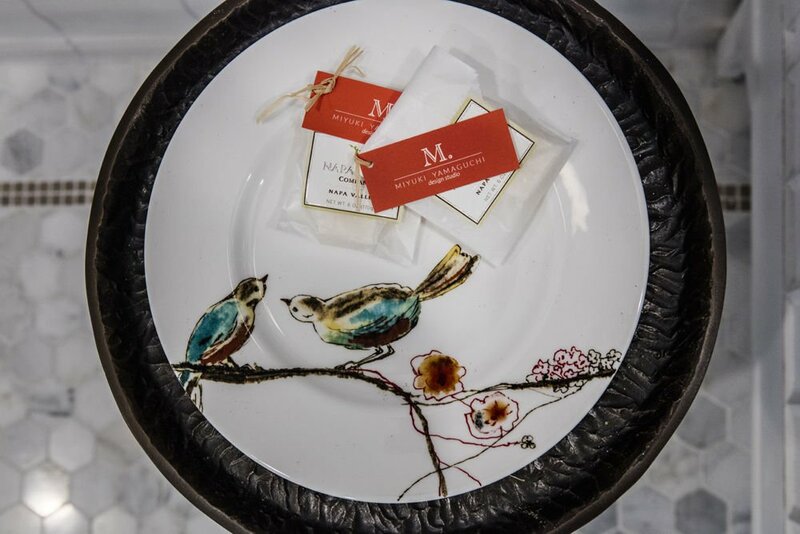 Designer Miyuki Yamaguchi gave samples of a Napa soap with a wine-themed fragrance to introduce and promote local businesses at the Designer Showhouse. A view of the bathroom that Yamaguchi designed for the 2016 Traditional Home Designer Showhouse in Napa. A painted birdcage adds a touch of whimsy to the bath design. "Birds were my inspiration to express the Napa lifestyle living in a harmonious way with the surrounding nature," Yamaguchi said. A detail shot showing the tile work on Yamaguchi's bathroom design. A farmhouse-style vanity sink sits below a mirror with a wavy frame, which Yamaguchi said reminded her of the Napa River. The work of local artists also found a place in Yamaguchi's design. Interior designer Miyuki Yamaguchi arrived at the Register newsroom with a list — not of projects, accomplishments or even things to do. It was a list of all she finds wonderful about living in Napa Valley. “I never knew a life like this exists,” said Yamaguchi, a native of Tokyo, who studied at UC Berkeley, and subsequently lived and worked in San Francisco and the East Bay. She and her husband were looking for a vacation home in Napa, but in the summer of 2013, they decided instead to make it the full-time home. Their daughter now is a student at Vichy Elementary School. Another thing on her list: No commute. After a career working for high-end designer studios, she launched her own Napa-based business, Miyuki Yamaguchi Design Studio. Yamaguchi’s enthusiasm for the valley mirrors her approach to design: a joyful commitment to helping people create the spaces that they will love. “Life is not about me. I just create feel-good spaces for others to enjoy,” she said. After graduating from Berkeley with a degree in architecture, she said, she was looking for a job as a designer and learned interior design skills beginning with her first $7-an-hour job. She went on to work for the San Francisco office of Gensler, an international architectural design studio with 46 offices in cities including London, Dubai and Beijing. Here, she took on impressive projects like the design for Lucasfilm’s Big Ranch Rock, adjacent to Skywalker Ranch in Marin County. “It was Lucasfilm’s office building campus in Prairie-style per his request,” she explained. Another assignment took her to Pittsburgh for the construction of a new Fairmont Hotel. This 3½-year assignment found her working with teams, deadlines and budget constraints. When it was finished, during a photo shoot, she noted, “The space I saw before me was grand with real ‘wow’ factors, grounded, comfortable, timeless and luxurious all at the same time. That’s what we were asked to design and that is what I truly saw … I gazed at the people walking by me, conversing with one another over cocktails or lounging by the fireplace in the corner of the lobby. It was clear that they were enjoying themselves in the space we had created. That pure joy, she said, she now finds in her Napa business, working on small as well as large projects, whether it’s consulting on paint choices or helping someone decide on tiles at Home Depot. Since moving to Napa, she has continued to teach at UC Berkeley Extension, and has also participated in the Traditional Home Designers Showhouse in Napa Valley for 2014 and 2015. In 2014 she agreed to decorate the front porch on a farmhouse for the Showhouse. Last year, she took on the challenge of creating a luxurious small bathroom in a vintage house on Randolph Street in downtown Napa. For her bathroom project, she incorporated luxury as well as whimsy, adding to white tiles, a country-style sink and a glass-enclosed shower another element that she likes in Napa, birds. Thus she included a pair of silver wings in the shower, a painted faux birdcage around a wall sconce, and paintings of birds from Napa artists. When the homeowner was delighted with his new bathroom, there again, she was satisfied. “As long as you have that excitement for your work, it makes me happy,” she said. As does adding to her list of things she loves about her own new home, the Napa Valley. The Miyuki Yamaguchi Design Studio website is MiyukiYamaguchi.com; email miyuki@miyukiyamaguchi.com; call 510-917-6090.